We will Edmodo for our Mobile Learning workshop so you can respond to and share resources and ideas. How many people can complete the survey in 24 hours? 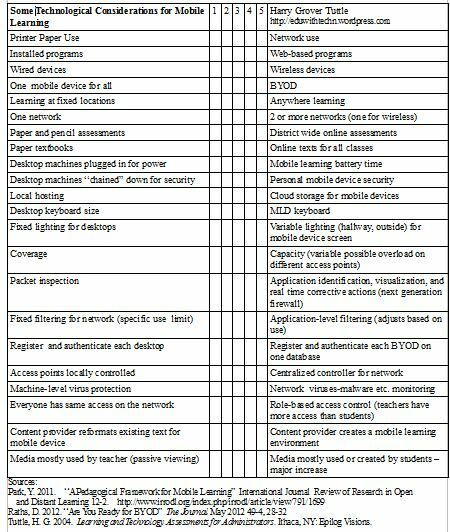 As you begin to plan for using mobile learning, use this grid to help you determine where you want to be. I feel that mobile learning with Smartphones, tablets, etc. comes as a natural outgrowth of Web 2.0 and therefore our pedagogy with mobile learning has to be Web 2.0 or more. Most older computer programs were top-down where the computer delivered the specific content and the student did that content in a specified path; they simply plugged in the answers. Web 2.0 tools are about the students creating and interacting. People used the older phones exclusively for talking. Mobile learning devices allow today’s youth to interact with the world, to create media, and to access information. Today’s youth determine what they want to do and then use their mobile learning device for that purpose. If educators want students to benefit from mobile learning devices in the classroom, then these educators have to change their teaching from the top-down deliver teaching method to student engaged-interacting-creating. 1. Since students can access factual knowledge from their mobile learning device, teachers have to move from fact-delivers to in-depth understanding and connections guiders. 2. Since students can text many other people and access multiple websites, teachers have to help students to evaluate and synthesize many diverse opinions about a particular learning concept/ situation. 3. Since students can access much discrete information, teachers need to help students to go beyond the discrete learning to see the big picture, the big concept or question. 4. Since students can easily create media on their mobile learning device, teachers will move from just student text reports to media reports to demonstrate the students’ higher level learning. 5. Since students can use the real world tools on the mobile learning devices, teachers will engage students in real life problems that use the critical learning. Math students can help design a new playground for an elementary school in their district. 6. Since students can easily contact others and can access the web through their MLD , teachers will turn to collaborative project-based in which students jig-saw their individual knowledge to form a bigger learning. 7. 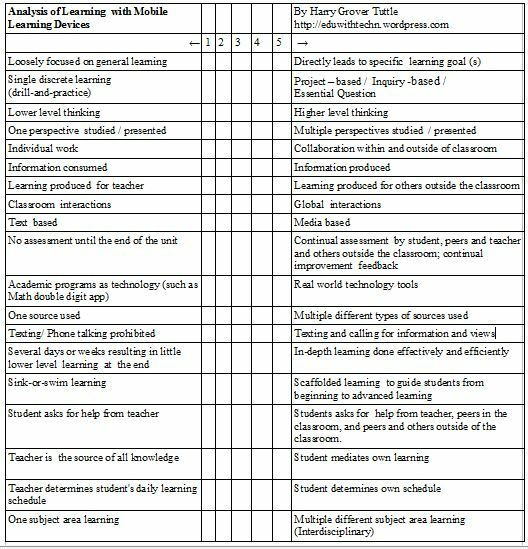 Since students can ask peers and others for information through their MLD, teachers will help students write better survey questions and help the students analyze survey data. 8. Since students can access online calendars and learning interactive environments like Edmodo on their Smartphones and tablets, teachers will empower students to be more responsible for their own learning. 9. Since students daily use their MLD, teachers can learn from the students about the many educational and real-world apps that help students to become better learners. So how has your teaching changed due to using mobile learning devices? I have 20 Spanish spontaneous speaking/fluency activities available at Teacherspayteachers: http://bit.ly/tpthtuttle.